"It is a truth universally acknowledged, that a man in possession of a modest fortune, must be in want of yet another bike." Jane Austen, Bikes & Prejudice. I'm already happily married, have several nice bikes and don't possess even a modest fortune, but I knew from the moment it emerged from the box that the Hewitt Alpine was a bike I was going to love. I was having dirty thoughts about a Canyon Endurace CF 9.0 SL, as reviewed recently but despite the Alpine having a lower spec and giving away more than 2.5kg to the Canyon, it's the green steel beauty that has moved into our kitchen. Light and flash is all very well, but you can't beat a bike that puts a smile on your face and is uniquely yours. Dear reader, I usually do about 500 miles on test bikes before I'm ready to send them back. So far I've done nearly 2000 on the Alpine and it's not going back because, thanks to an act of wifely benevolence, it now belongs to me. In a sea of lookalike carbon sportive bikes, the Alpine stands out a mile. Ok, so it's technically an audax bike, but what is a sportive but an audax without the cake? If you want a distinctive bike that will be fast and comfortable over long distances then the Alpine is well worth checking out. If you just want to splat down a wedge of cash and walk away with a flash bike to impress your mates, the Alpine isn't for you. 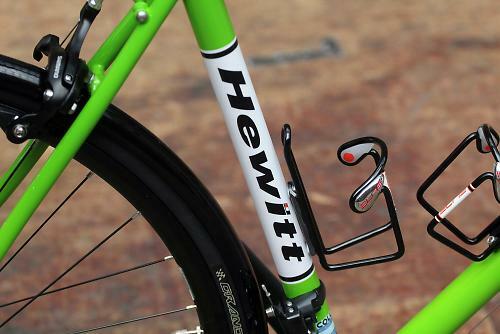 Hewitt sell the frameset and will build it up with pretty much any bits you want, so you'll have to conduct some research before deciding on the final spec. A bike like this requires attention and commitment and spending hours pondering options is all part of the fun. Hewitt sell the Alpine as a frameset which can be built from a number of different grades of tubing and dressed to suit your taste and pocket. 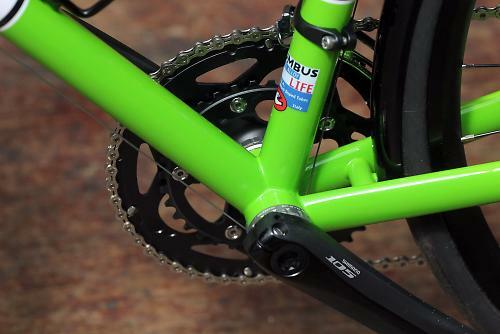 Frames start from £1050 for Reynolds 631 through to £1800 for Reynolds 953 stainless steel. 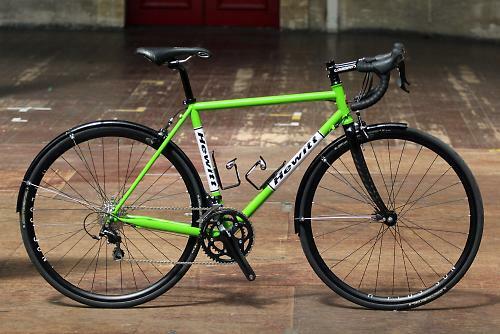 Our test bike was built from Columbus Life tubing which would set you back £1350. Life is a race grade tubeset, so it's light, stiff and a touch more responsive than 631. All Alpine frames are built by Andy Robinson in the workshop at the back of the shop and you can pick and choose every last detail. Paul sent me some pics of the frame as it was being built, which you certainly wouldn't get from even the very nicest off the peg bike. 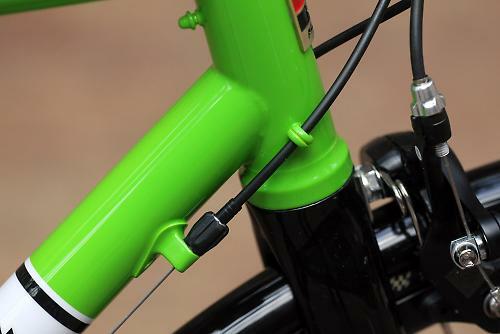 Ours came with braze-ons for mudguards, rack mounts, a pump peg on the top tube and cable guides on the head tube. The Alpine is built to the precise measurements of each customer, hence ours has a 53.4cm virtual top tube (my off the peg bikes are 54cm) and a half degree extra seat tube angle to free up some space on the saddle rail for a bag support. The Kawasaki Green paint job (by Autostrada) is excellent and really stands out, especially with the (optional extra) white panels. I picked up a nasty stone chip on a chainstay and it was easy to see how thick the enamelling is. Speaking of chainstays, although the words 'bespoke steel' evoke something very traditional, the Alpine has modern touches, like oversized tubes, a semi-compact top tube and flattened chainstays. It's a pleasing mix of the traditional and up to date. The fork is a pretty generic carbon item, with an aluminium steerer. It does have a nice curve though, which suits the bike better than a straight bladed item. It's a frameset which has the stiffness to climb well and go fast, but which doesn't beat you up. In fact the defining quality of the bike is the smoothness of the ride, it glides where other bikes would bounce and judder. 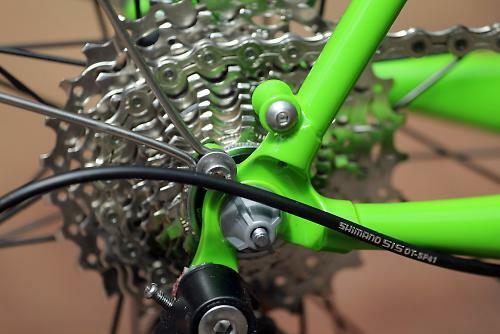 Our test bike came with a Shimano 105 groupset, which is plenty good enough for audaxing. You could easily go higher, the frame is definitely worth it, but 105 is a good balance between value for money and performance. A 50/34 chainset, matched with an 11-28 cassette, gives nearly as good a range of gears as a triple but looks neater and weighs less. The 105 shifters work nicely, with a positive click from the inner lever, but the exposed mechanism on the underside of the hood can occasionally be uncomfortable if, like me, you ride with a finger curled under the hoods. 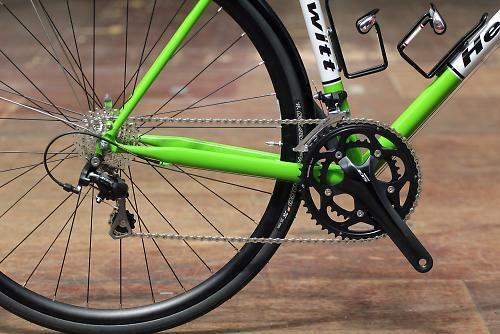 One nice thing about the 105 chainset is that as it comes in black it gives the bike a very tidy look. The brakes are Shimano R650 with 57mm drop, which gives enough space for full mudguards and 28mm tyres. They work perfectly well, although the standard pads are a touch wooden and I'll be swapping them for something better when they wear out. It's something that I've noticed about blocks supplied as standard, so it's not a criticism of the brakes per se and they worked just fine when I had to dodge a suicidal squirrel on a fast descent! The wheels are interesting. The black H-Plus SON rims have been appearing on a few bikes now, the Genesis Equilibrium we tested springs to mind, and laced to DT Swiss 350 hubs it's a wheelset that looks fantastic. I did wonder whether the semi-deep section rims would give a harsh ride, but with a wide tyre bed the 25mm Continental GP4000s inflated to a width that looked more like 28mm. Combined with the frame the ride quality is exceptionally smooth. The bike also felt fast and climbed very well - on a hilly 90 mile test ride it was much faster than my usual audax machine. That said, the wheels are on the hefty side. A quick dangle on the fishing scales showed that the front wheel was a whopping 500g heavier than an 11yr old Ksyrium Elite. I can't honestly say I felt the wheels were slowing me down, but it would be interesting to try a lighter set. My hunch is that lighter wheels would climb even better, but wouldn't be as smooth or as comfortable over a long distance. I would consider changing tyres though. The Continental GP4000s are just a touch more fragile than I like, deflating from two thorn intrusions that a Gatorskin would have laughed at, but they roll well and tyres are almost as much a personal choice as saddles. 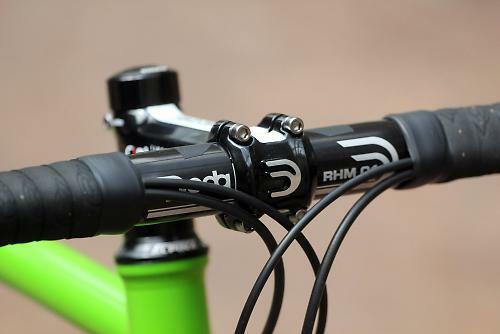 The rest of the kit is decent quality stuff - Deda bars and stem with a Richey seatpost. 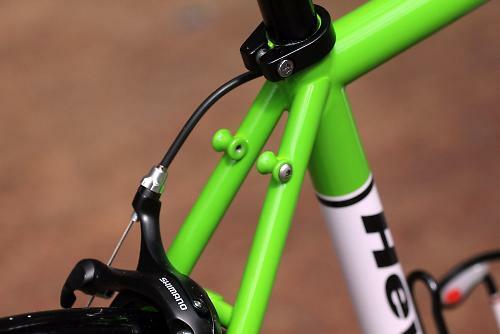 To be honest these aren't bits that excite me that much, but the shallow drop on the compact bars suited me very well and you could easily choose your personal favourites. The saddle was a Selle Italia Max Flite Gel Flow. Initially it was okay, but once the mileage went over 40 miles it was just way too hard, so I swapped it out for my regular Brooks. Listing and commenting on the various components is all very well, but a bike at this price has to be more than just a dry spec list, it has to be on something that reaches in grabs your heart and makes you start planning epic rides, right? Although I love my trusty Dawes Century SE, which took me on LEL, the Alpine is faster, smoother and just plain nicer. It's closer to being a race bike than a light tourer and it's an absolute blast to ride. There's a clue in the name - this is a bike designed for long distances. Very lovely indeed. Fillet brazing is available for an extra £100, but the finish on our TIG welded frame was very tidy indeed. The paint job, by Autostrada, is fantastic. It's thick, lustrous and very smart, especially with the (optional) white panels. 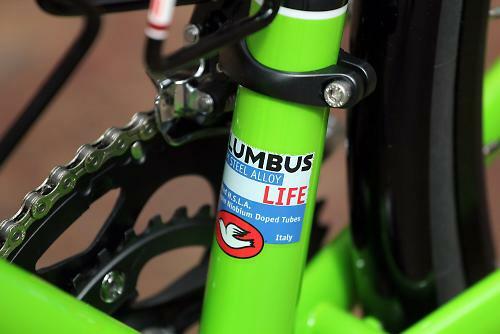 Columbus Life steel tubing is used for the frame. 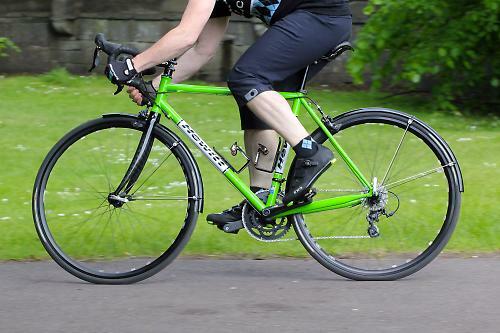 It's light, strong and has been built into a stiff and responsive bike which remains comfortable. The fork is generic carbon, there's not much to say about it in isolation, but the bike rides like a dream. Despite this being a custom built bike, the geometry isn't exotic or unusual although the seat tube is 75.5 degrees rather than 74, to free up some extra space on the saddle rails for a Carradice Bagman support. The virtual top-tube length is 53.4cm rather than the more usual 54cm. I normally ride 54cm frames, but they can be ever so slightly long. The sizing and fit of the Alpine was, unsurprisingly, absolutely spot-on. Very comfy indeed. In part because of the precise fit (although this is only ever a work in progress) but also because of the forgiving nature of the frame and the wide rims, which maximise the comfort available from 25mm tyres. For long distance riding you don't want a bike so stiff that it beats you up, but nor do you want one so soft that it wastes valuable energy. The Alpine is a perfect compromise between the two, thanks to the combination of frame and tyres. How would you describe the steering? Was it lively, neutral or unresponsive? It's quite lively, although not as twitchy as a full-on racing bike. 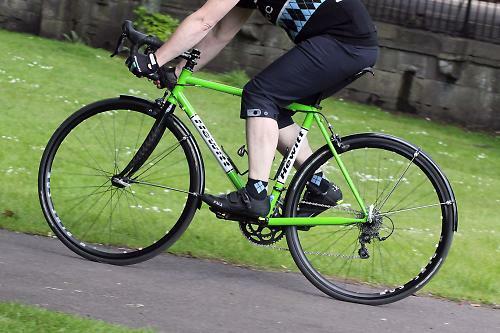 Sharper and more nimble than a light touring bike, but not as twitchy as a full race machine. Although the tyres are nominally 25m, the H-Plus SON rims are very wide, which means that the tyres have an effective width closer to 28mm. That translates into a very smooth ride. On the other hand, the saddle was rock hard after more than forty miles and was quickly swapped for my usual Brooks. I wasn't absolutely sure about the wheels - there was definitely some brake rub when honking up steep climbs, but I'm a sturdy lad (80kg) so that's not entirely surprising. I'd be interested to try out some lighter, stiffer, race wheels to see if they make a difference, but I wouldn't want to change the way the bike rides. As an audax bike there's inevitably a trade-off between outright stiffness and comfort, but the Alpine gets it just right. The wheels aren't especially light, but it responds well when asked. Very good, even when slamming the brakes on to dodge suicidal squirrels on a sketchy descent. Climbs very well but I wonder what effect lighter wheels would have. Full 105 is pretty faultless. For a bike which is going to have a hard life, 105 is a good compromise. It's reasonably light, pleasant to use and should last. Lighter (and much more expensive) components wouldn't be at all out of place though. The only thing I don't like about 105 is the exposed mechanism underneath the hoods, which occasionally chafed my middle finger. Not light, but the bike rides beautifully. Conti GP4000s are fast, but more fragile than Gatorskins. Semi deep-section rims look great, but add weight. Wide rims maximise the comfort available from 25mm tyres. I honestly don't known whether I'd change the wheels - taking the bike as the sum of it's parts I'd keep them. It's fantastic to ride, climbs well and shifts when you push hard. However, there's no getting away from the fact that the wheels are on the heavy side and lighter wheels would be faster, but possibly to the detriment of the ride quality. 105 hoods have exposed mechanism on their underside, which can rub. 105 is a good compromise between performance and value. Did you enjoy riding the bike? Hell yes! Would you consider buying the bike? Definitely. In fact, I pretty much have. You could easily buy lighter and cheaper, but few bikes will have the class, character and ride quality of custom steel. 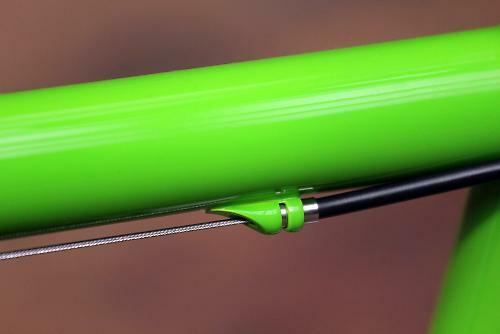 I'm curious because I've never heard of it: what is a 'semi-compact top tube'? Am I missing something? £1350 for the whole bike seems about right. My kind of bike, albeit not at my kind of price. Had mine five or six years now (custom frame entirely justified by freak proportions), and have to concur with the review. Just to add on your pondering re. wheels, I've had it set up in two guises over those year 'basic/intermediate kit' (mostly 105 and some campag, triple set up and rigida rims/dyno hub etc.) and then blinged up a bit with full campag chorus (old 10spd) compact, and lightER wheels by building hope pro 3's with velocity A23's and the wheels definitely made a big difference (I swapped them back to check). Quality of build is good too, had a couple of compliments from other frame builders on it. "If you just want to splat down a wedge of cash and walk away with a flash bike to impress your mates, the Alpine isn't for you." Who know enough about bikes to be impressed with this one! Archetype rims are top notch. Maybe the hubs are heavy. Looks classy, I wouldn't say no to one. Not level, but not a full compact (which would have a much more dramatic drop). £1350 for a heavy steel frame with external cable routing? Hmmh. 'Made to measure' because the top tube is fully 0.5cm higher than the standard the tester is used to using __ whoah, what a HUGE advantage! One day, just *maybe*, they'll invent a means of adjusting the saddle and steering height independent of the frame. Until that day these 'bespoke' frames, and their utterly absurd prices *can* be fully justified. Not. I love cycling and I love bikes but I fail to see why you'd pay a premium for the technology of the 70's. The only good thing about bikes in the 70's was that the chains used to last for 10K miles. But then you only had 10 gears maximum. You do have a point re made-to-measures lack of difference for us fellows with classic proportions. Not sure the tubing is 70s tech though? I'm forever reading about improvements in steel tech. Maybe that's sales patter, I'd have no idea. The point about 70's tech is complete rubbish. I bet 70's pros would have killed for a frame built from Life tubing. For reference, the Pinarello Miguel Indurain rode in 1993 weighed more than 10kg (source - http://felixwong.com/2010/11/tour-de-france-bicycles-historical-bike-weights/). The Alpine weighs 9.6kg, but lose the mudguards & fit some lighter wheels and I reckon you could easily get it down to 8kg and that's without even touching the groupset or other components. Well said. I found this review interesting in the fact that I would never think of looking at Hewitt Cycles. The bike is stunning, well priced and ideal for the reviewers type of riding. He will be out all year round. While the fat ex golfers who have bought a carbon race bike even though they never race have no bike to go out in the winter. I personally can't wait for some bad weather so real cyclist who just enjoy cycling for the pleasure of being ouf on your bike get to take the roads back of the wanna be fat Chris Froomes Johnny come lately posers. Got a bike fit at Paul Hewitt's and they built me up an 'addax' bike with a Van Nicholas frame and similar finishing to this bike. Top shop, with friendly and knowledgable staff, can't recommend them enough. Understand the sentiment so much of this review. Got a Genesis Equilibrium recently, after having a Canyon CF for 2 years and it's just sublime. I get the whole lure of carbon, especially for new cyclists, but I think it's more of a tool and would only shine when you have the fitness of a solid cat 2/3 and upwards. I had an Alpine built a few years ago with Ultegra 10 speed. The build quality is second to none. It still looks as good as new now after years of dirty winter riding. 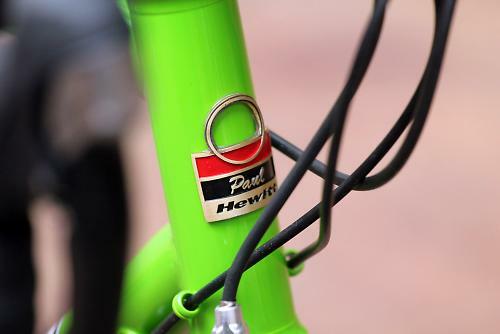 The paint finish is as good as any top of the range frame and the frame build and quality of the assembly is faultless. It rides beautifully. Even after riding my Colnago C40HP all summer I still love getting on the Alpine. 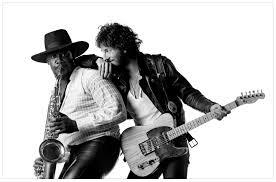 Ride quality is sublime. So responsive and so comfortable too. 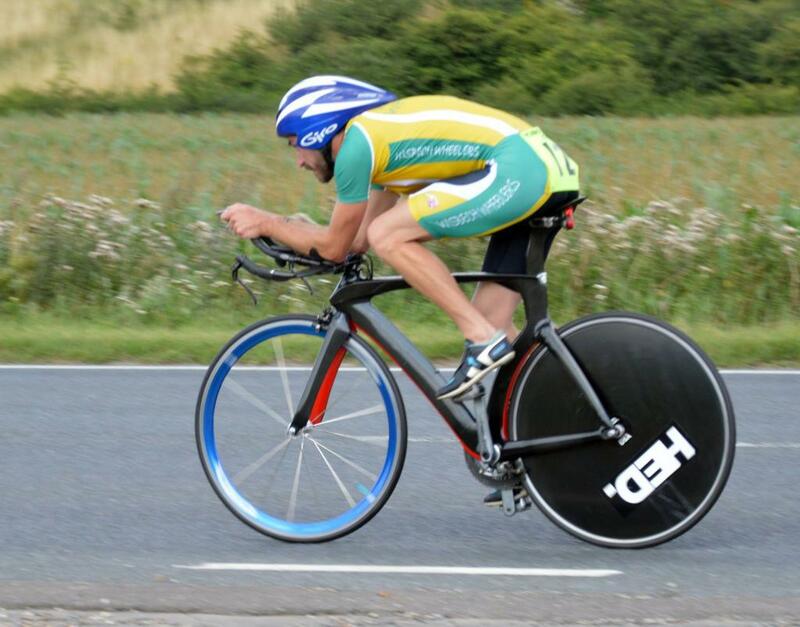 I would heartily recommend anyone after this sort of bike to contact Paul and book yourself in for a measure up! You will not be disappointed, I guarantee. Any bike that would make a chance conversation with someone like Joe less likely, as he scurries away in disgust, must be one for the shortlist, eh? I agree to a certain extent. There seems to be a kind of inverse snobbery about some bikes - a certain "hipsterish" irony. Hell, yeah - the Kawasaki green makes it stand out. It isn't black, it's not made of carbon and looks a bit frumpy - ergo it has "character". Being brutal you're saying: "I know about bikes and I'm happy to buy a frumpy old skool bike - but only if I pay enough for it to show I know about bikes..."
I've just built my old (80's) steel frame back up ( it has spent the last 18 months on the turbo), it felt 'weird' for 2/3 days (geometry is a little *ahem* idiosyncratic. Now I remember why I love it. I didn't mean the review to have a 'steel is real' vibe - after all, I was hankering for a Canyon before the Hewitt rolled into my life. However, when it comes to the old 'how much does it weigh & what's it made of?' stakes, the Hewitt gives a lot away, but makes up for it with the ride quality. 'FRUMPY'??????? Wash your filthy mouth out! BeatPoet - there can be inverse snobbery, but that does not have much to do with the bikes, more people. As for steel, I think more people should try it. Best looking bike I've seen for ages! 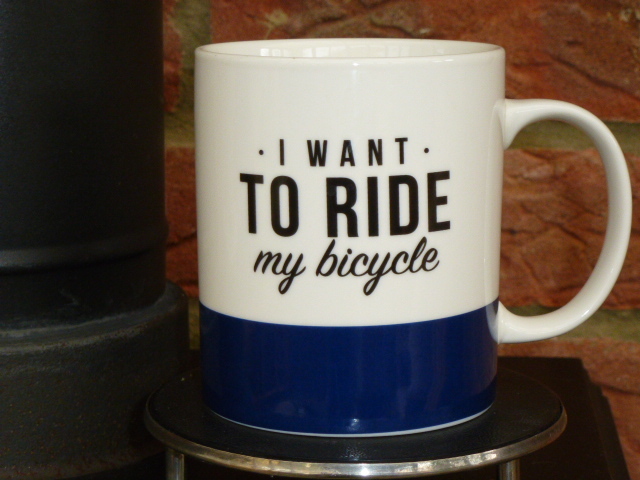 I think there is a huge amount of snobbery and entrenched opinion in bike buying - not all of it bad because we can't all be the same! For example, my local shop stocks Pinarellos, but even if I could afford one I wouldn't buy one as I don't like the kink in the forks! Totally irrational as I imagine they must be some of the best bikes going!